It has been such beautiful weather recently it makes us so glad to be out in the country. We love it - couldn't be in a better place at a better time. Lots of maintenance issues this year though. The cold winter we had did a lot of damage around here - trees are just now getting fully leafed out - we lost several fruit trees. The llamas and chickens are doing well. We've talked for some time about getting into another animal - first a horse, then a couple of cows. As we read and find out more about the nitty gritty, they are not as attractive as they used to be. So the current thoughts center around adding some goats. We just planted the garden - all the usual suspects - lettuce, carrots, cantelopes, peppers, tomatoes, potatoes, onions, limas and green beans. 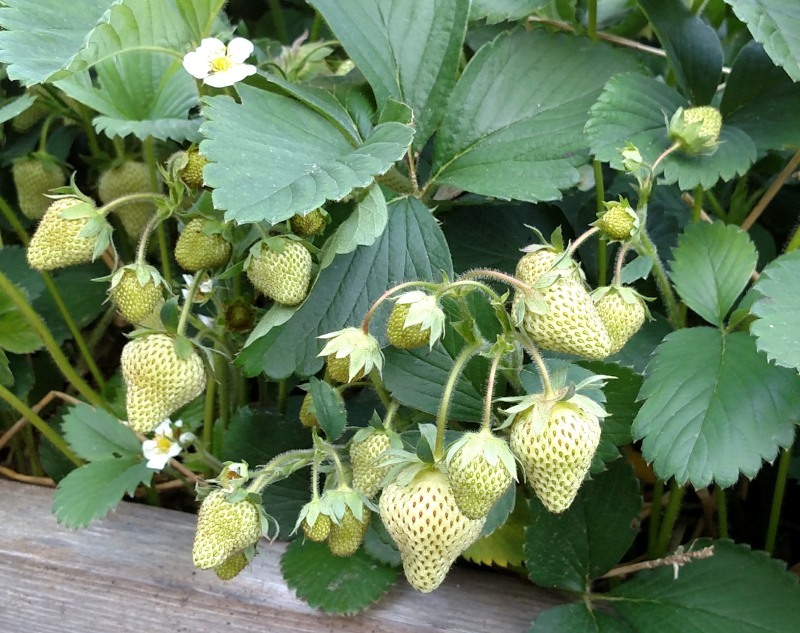 Always pretty neat to watch the strawberries develop right about now - they will be ripening in a few weeks. The dates for the movie nights are on the calendar (Scheduled Events menu item) - still working on what movies to show. We'll have that and our annual party date worked out soon. Enjoy the summer! Come on out and enjoy the scenery and tranquility with us - we love visitors. We start selling our chicken eggs today. We were starting to get over-run with them and figured we'd put a sign out on the road and sell them $2.50/dozen on Wednesday afternoons. Not a money maker but maybe we can pay for the chicken feed with it. We are still collecting the 1 dozen size egg crate if you have any you can donate. Get periodic email reminders about various activities - (only 3-4 times per year).